Launched in 2012, the Atlanta Media Industries Project at Georgia State University is a research collective concerned with studying the evolving media ecology of Atlanta, the Southern region, and beyond. Our research agenda leverages the rich diversity of media activities currently taking place in and around Atlanta. Although we are located in Atlanta, our broader research agenda is national and global in scope. (Ph.D., University of Southern California) is an Assistant Professor of communication at Georgia State University. She also serves as a research fellow at the USC Center on Public Diplomacy and the Media and Democracy Research Fellow at the Center for Global Communication Studies at the Annenberg School for Communication, University of Pennsylvania. Dr. Arsenault’s work on global media ownership concentration has appeared in edited volumes and in journals such as Information, Communication, & Society, International Sociology, and the International Journal of Communication. She is currently conducting an extended research project on information warriors on the web. She also holds a B.A. in Film and History from Dartmouth College and an MSc in Global Media and Communication from the London School of Economics and Political Science. Prior to beginning her academic career, she served as the film coordinator for the Zimbabwe International Film Festival Trust, a non-profit arts and culture organization dedicated to promoting visual literacy in Zimbabwe. (Ph.D. University of California – Santa Barbara) explores the ways mobile devices and platforms empower consumers to use popular culture in the workplace, on the commute, and in the waiting room. He has written book chapters on creative labor, online sports viewing, and connected viewing as a contributor to the anthologies Saturday Night Live and American TV (Indiana Univ Press, 2013), Digital Media Sport: Technology and Power in the Network Society (Routledge, 2013), and Connected Viewing: Selling, Sharing, and Streaming Media in a Digital Era (Routledge). Tussey is the Coordinating Editor of In Media Res. He currently teaches Television Analysis, Media Industries, Media and Popular Culture, and Interactive Media. 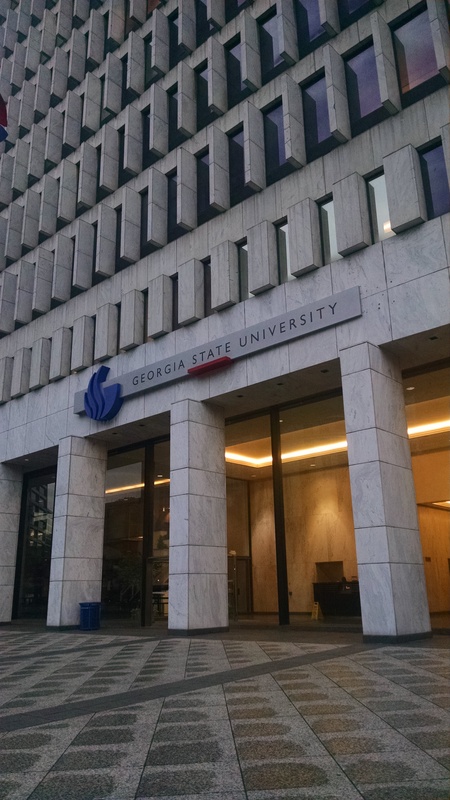 The Department of Communication at Georgia State University offers programs of instruction in journalism, film and media studies, public relations, rhetoric and speech communication, theater, international communication, and media production. The intellectual and creative energies activated by this rich range of activity make the department an ideal place to prepare for a professional career in communication or education and to undertake research that makes a difference. Students are mentored by a highly acclaimed and passionate faculty that includes Emmy and Sundance-award winning media makers and accomplished and prolific scholars, and accomplish this work in state of the art laboratories and production facilities. The department offers a Ph.D. in Communication Studies with emphases in Public Communication, Media and Society, or Moving Image Studies; MA degrees in Communication with emphases in Film/Video & Digital Imaging, Mass Communication, and Human Communication & Social Influence; and undergraduate degrees in Communication with majors in Film & Video, Journalism, and Speech. For more information about these programs, please consult the department website.